If you're looking for gloves that offer excellent dexterity, the MaxiFlex Cut Lightweight Palm-Coated 34-8743 Gloves are ideal for you. Designed for the handling of small components, these are some of the thinnest gloves on the market. This helps you remain as dexterous as possible throughout use. These are designated Category II gloves, meaning they should be suitable for most medium-weight tasks. The gloves offer moderate protection against mechanical risks, making them suitable for use in environments with physical hazards where there are no other hazards present. 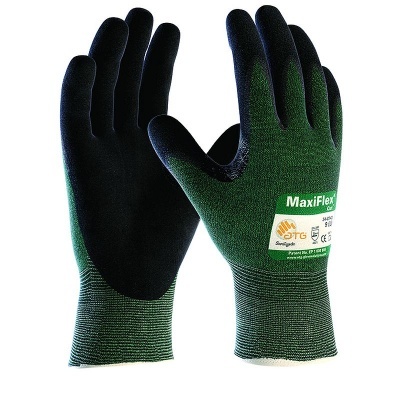 The MaxiFlex Lightweight Gloves are available in six sizes to fit most hands. Please measure the circumference of your hand around the knuckles (excluding your thumb) with your palm open and your fingers together. Next, measure the length of your hand from the tip of your middle finger to your wrist. Watch the short video below to find out why the MaxiFlex Cut gloves have become the world standard for precision handling in dry environments. These gloves offer an unbelievable level of protection consider their thinness. They are very good to wear as you have good feeling in the fingers for weeding or gripping tools and do not get too hot to wear. These gloves are great for protecting your hands.